I’ve marveled over the years about both the reach of my occasional posts and the staying power of one particular one from 2013. It’s less about me and more about the power of serial storytelling. YouTuber “MissFinlandia88” started subtitling the gay love story between Elias Vikstedt and Lari Väänänen on the Finnish soap Salatut Elämät (more or less, Secret Lives) about five years ago. In early January 2013, I first wrote about this pairing and how, thanks to one intrepid YouTuber, the show and this couple gained a worldwide English-speaking fanbase. It has been the most-read post on this blog since the beginning. Social media, you see, works along the same constructs as a soap opera. Paavola (left) and Roslöf portrayed Elias and Lari on a Finnish soap opera, known around the world thanks to an intrepid YouTuber who subtitled their scenes for an English-speaking audience. Sadly, for fans of the Elias and Lari pairing — now known worldwide by the portmanteau Larias — the show has decided to kill off Elias, a shock twist that’s left fans reeling. Elias came on as an already-out high school student and the son of one of the show’s long-serving characters. He fell for, and had a closeted romance with hockey star, Lari, whose tortured coming-out was the basis for much of their early story. But, it was less about the writing and more about the chemistry between the actors Petteri Paavola (Elias) and Ronny Roslöf (Lari) that propelled the story and sparked the imaginations of the fans. When Paavola left the show for several months last year, Roslöf’s character took up with older doctor Kalle and now, in spite of Kalle’s recent rampant alcoholism, maybe he’ll once again take up with the grief-stricken Lari, who’s still recovering from a recent gunshot wound. (He was accidentally shot by Elias.) It’s a soap, remember! In a recent Instagram post (above) Paavola thanked the couple’s fans and MissFinlandia88 who “took our story around the world.” He also thanked English-speaking fans on YouTube. Well, all good things come to an end. For Paavola, who has been moonlighting as a real estate agent, he’ll still keep in touch with his on-screen ‘better half.’ The duo have become good friends and even play hockey on the same team. You never know where even a made-up gay relationship will take you. To start over and watch everything, check out MissFinlandia88’s YouTube channel. Petteri Paavola, in case you are not in the know, is a young man who has played the role of Elias Vikstedt in the Finnish soap opera Salatut Elämät for the last four years. Ronny Roslof (left) and Petteri Paavola portrayed lovers Lari and Elias — known by fans worldwide by the portmanteau Larias — on the Finnish sudser. Roslof remains on the show, his once-closeted character is now in an out relationship with an older man. He announced recently that he was leaving the show and the character was written out, having headed to Belgium to live with his mother. It’s not known at this time if he will return. The relationship between Elias and Lari captivated audiences around the globe, thanks to YouTube and the good offices of MissFinlandia88, the handle of the dedicated YouTuber who subtitled these clips in English — and even got the show’s blessing to do it. What do I care? Well, a post I wrote about Salatut Elämät in January 2013 has been the most-read piece on this site for two years running. Go figure. Who knew gay Finnish soap opera characters would bring so much of the world to me? If you don’t come back — or even if you do, — thanks, Petteri. I’ve enjoyed meeting so many of your fans! 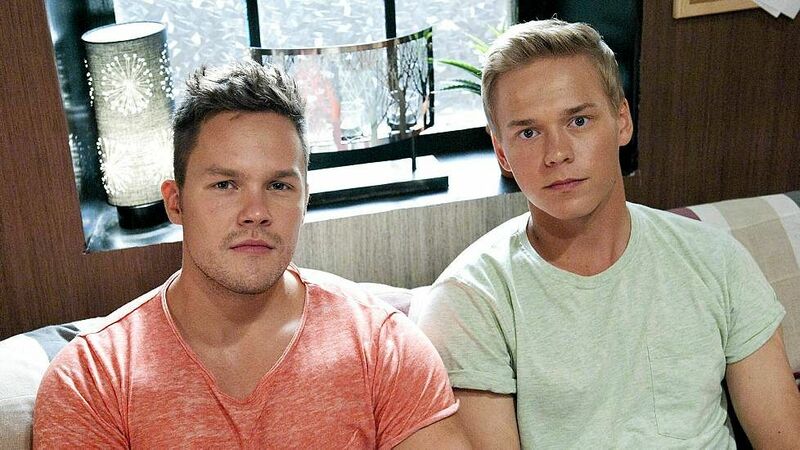 Petteri Paavola (left) is out teen Elias and Ronny Roslöf is closeted hockey player Lari in the Finnish series Salatut Elämät. I first wrote about the Finnish soap Salatut Elämät back at the beginning of January. Since that time, my original post has been read hundreds and hundreds of times (thanks, btw) and is rarely not one of the most viewed pages of the week here on my little cranky corner of the Web. YouTube user missfinlandia88, who has been captioning the storyline of Elias and Lari that has caught on with English speakers from around the world, informs us that today’s episode — a good soapy cliffhanger — ends the series until it comes back from its annual hiatus in September. For all you “Larias” fans today’s cut from what I call “Lots of Umlauts” will have to tide you over for the summer!